Continuous level control, using a level sensor, would allow for cost-savings if applied using a properly-sized variable frequency drive (VFD). The VFD would allow more consistent level control, improve reliability in not requiring a control contactor and decrease operational costs. Employing a non-contact level sensor will supply a feedback to the VFD and would allow the pump to ramp up/down as the inflow increases/decreases. If the level goes too low, you could put the motor in an off state until the level reaches a set point. You may also want to suggest a second motor that could come on if the level gets too high; you could use another VFD controlled from your master to control that motor, or alternatively to keep costs down, a contactor. If the system is sized properly however, this shouldn't be a concern anyhow. Of course, you'll still want to use an on/off bypass should the sensor or VFD require service or preventative maintenance. The pump would only run if the level is above a minimum set point (say 20% of the range). If it's variable flow, you will probably want the pump to be able to keep up using an analog signal from a level sensor. Personally, I would allow the VFD to control the motor above a certain tank level or inflow rate. But I've used variable frequency drives in similar applications where there is a variable flow rate coming back into a holding tank and the system demands a certain pressure out from the tank. That particular application was a fairly high volume and flow rate so it may have been more suitable for variable control; in that application, if the level got too high we had no guarantee that it would be able to keep up with additional volume that was supplied to the holding tank. 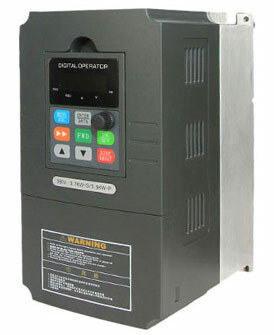 Using a VFD allowed me to continually adjust the pump outputs depending on level. Your application may be more suited to the fourth option.